I had been hoping to see this movie for quite awhile, but this past week’s Top 10 Show made me even more interested. 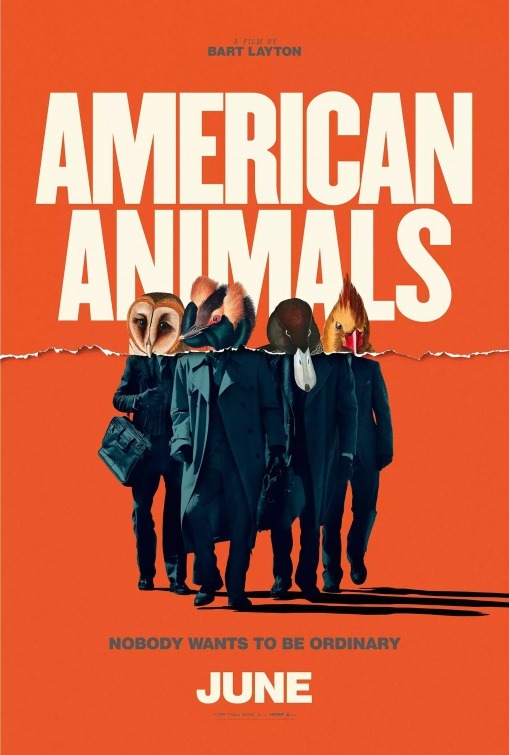 Matt Knost, one of the co-hosts of that podcast, listed American Animals as his number two movie of the summer and he said that he nearly placed it at number one. That rave was fresh in my mind when I happened to find it at the iTunes store. While I might not put it at number two on my list of summer movies, there is no denying that this film is something special and worth every minute of its run time. In this true story, four intelligent college students from Kentucky plan out one of the most audacious robberies in U.S. history as they tried to steal several million of dollars worth of rare books from the special collection section of the library in broad daylight. The film focuses on the four young men and their involvement in the caper. The film was shot in an original style, part documentary featuring the real life people and part re-enactment as actors took on the roles of the real students. Leading the cast was the spectacularly chaotic Evan Peters as Warren. Peters brought such a sliminess to Warren and yet he had that charisma that makes you understand how he could convince two others to join them. Warren and Spencer (Barry Keoghan), who portrayed a certain innocence that felt corrupted by what happens in the movie, plotted out their plan for the heist before realizing that they needed to have help. They recruited former classmate Eric (Jared Abrahamson) and Chas (Blake Jenner) to fill vital roles in the heist. As events began spiraling out of their control, the four students found themselves in way over their heads without any real way out. What was thought as being fun and adventurous turned into stress and guilt-ridden compulsions. As their perception of the situation became more realistic, each man had to face their role in the crime. Ann Dowd played Betty Jean ‘BJ’ Gooch, the librarian in charge of the rare books. The fact that there was just one individual librarian overseeing the books propped the crew up, making them believe that this was going to be an easy heist. It turned out to be anything but. The story takes some unbelievable turns that prove why the old cliche “Truth is stranger than fiction” became a cliche in the first place. What at once seemed to be a simple and fail free crime turned into a cluster quickly. And the improvisational skills of the thieves were certainly not well developed. The film felt like two separate films. The first half was up and exciting, with great music to match. Any time I can hear Donovan’s “Hurdy Gurdy Man,” I think it is well worth it. Add in Ace Frehley’s New York Groove and the soundtrack is awesome. However the second half of the movie highlights the characters’ panic and frustrations, bordering on deep regret. This feel is compounded by the interviews with the real culprit. The film also plays with point of view as Spencer indicated that he was not sure what exactly he had seen or how he remembered what was going on. The film brought that out as a element of the story and it made the film feel even more like a documentary. This was an extremely well acted, overly original, fantastic heist movie that becomes more than just that. It is a look at the mind of these four students who believe they are doing something exciting and adventurous, but they discover quickly that the lives of big time art thieves may not be what they are cut out for. Thanks Matt for the recommendation.